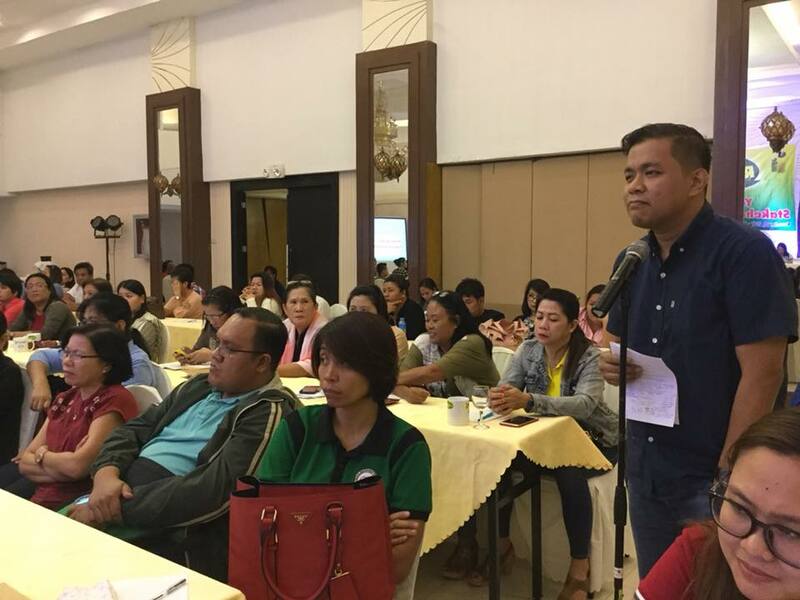 For continuing partnership with its stakeholders, PhilHealth has again conducted the ReachOut Forum with hospital owners/ administrators at FB Hotel, City of Koronadal, South Cotabato lately. “You, our partner health care providers and stakeholders are principal players in the success of our country’s National Health Insurance Program. However, as partners in the health care system we sometimes encounter complexities in achieving our respective goals. But because our client’s health is our main concern, we con conspire on a common point for us to work in harmony. Finding that harmony is the very purpose of this forum as we will present to you updates and latest development on our National Health Insurance Program,” PhilHealth XII Administrative Officer, Bienvenido L. Borra said during his opening statement as he welcomed the participants on behalf of the Regional Vice President, Dr. Miriam Grace G. Pamonag. 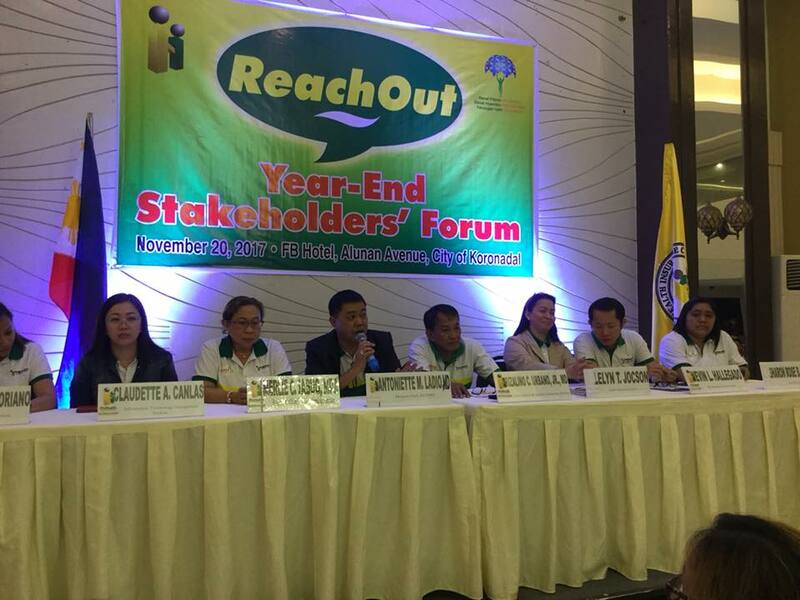 Members of the panel during the Year-End Reachout Forum with health care providers last November 20, 2017 at FB Hotel, City of Koronadal. Seated L-R: Finance rep, Ma. Luna C. Soriano; ITMS Head, Claudette A. Canlas; Management & Services Division Chief, Merlie C. Sabug, MPA; Health Care Delivery and Management Services Division OIC Chief, Dr. Antoniette M. Ladio; Benefits Administration Section representatives, Dr. Rizalino Urbano, Jr. and Lelyn T. Jocson; Membership Section Head, Nevin L. Hallegado and Legal Office rep, Sharon B. Ysmael. Issues and concerns taken up during said forum vary from benchbook requirements, membership qualification, adjustment of contribution requirements by 2018, No Balance Billing Policy implementation and submission of Statement of Account in the benefit availment process. The Chapter’s Philippine Hospital Association (PHA) President, Dr. Renato Diagan on the other hand, personally voiced out his concern on claims that has remain unpaid since 2016. “I hope that PhilHealth will find ways and means in processing said reimbursement considering that we are also spending money to settle our mandatory bills including salaries and wages for our doctors and nurses. You should have facilitated first our concern because we have also taken care of our patients. I know you are only following the rules but the process should be done without delay,” Dr. Diagan said. PhilHealth XII Legal Office representative, Sharon B. Ysmael replied that the office is doing its part and has to go through the legal process in order to solve his concern and that of other hospitals having the same problem. “We are trying our best to accommodate all of your concerns,” Bona said.